Directional signs are necessary for eliminating confusion in traffic flow. Allow us to help you show the way with our custom directories. These informational assets will help anyone steer their way through any building or campus. Dimensional letters make your company logo seemingly jump right off the wall! 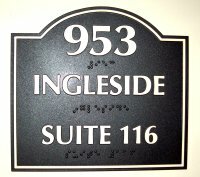 Dimensional letters can be constructed from several different types of materials to fit your individual needs, with all having the same popping visual results. Whether indoors or out, your company logo will stand out. Literally. The Americans with Disabilities Act requires all rooms in a public building to be marked with Braille signs identifying each individual room. Without a doubt one of the most eye catching forms of marketing today. Our wide-format printers produce full color, photo quality images that can be utilized on virtually any surface. Let us ignite your marketing with a full color digital print for your sign, banner, vehicle, window, or wrap virtually anything!